Home / Posts Tagged "john muir"
Michelle explained to me that both her and Eric had put a lot of thought into location ideas for their wedding. 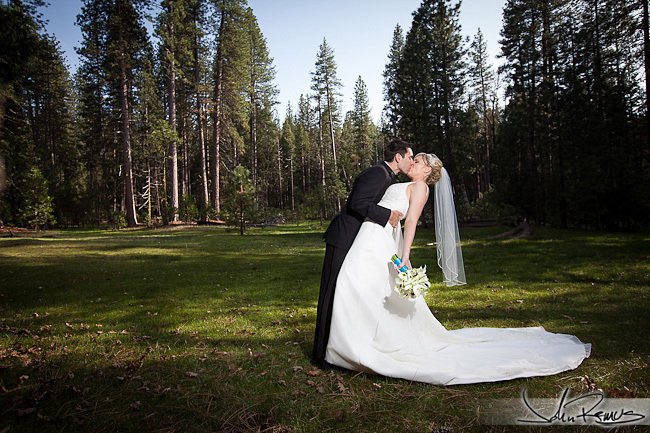 And that after considering several typical locations/settings they ended up deciding on Yosemite for their ceremony. Rather than do a rushed ceremony in the main valley, the Boyko’s selected Evergreen Lodge for a much more relaxed and intimate weekend with their closest friends and family. I had met Eric and Michelle a year ago, through the car community which both Eric and I are active in. I remember during that evening that Michelle stood and talked to me for quite a while about wedding photography and some of the various traveling I had done with my work. And as things turned out, I ended up being asked to shoot for them later on in their finalization of their wedding plans! The weekend at Evergreen was awesome. Eric and Michelle kept their wedding very small – only their oldest and closest friends and family members were in attendance. And Evergreen keeps their weddings to a one-per-weekend setup. This is incredibly rare and also quite amazing because it allows the Lodge to be available and tend to their wedding party’s needs throughout those couple days. Michelle said that was actually a major factor in their decision – that it avoided the assembly-line feel of getting married in a location with two weddings per day or more. 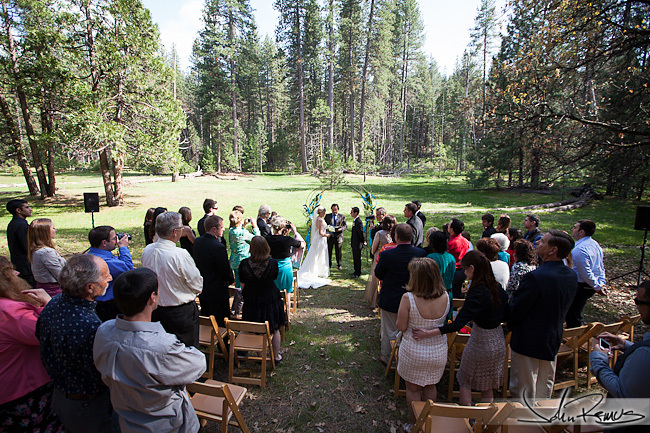 So Eric and Michelle were married in a meadow. It was beautiful, and the weather that day was perfect. Actually, the weather the whole weekend was pretty amazing. Everyone arrived on Friday afternoon and checked in. After a short rehearsal and walk-through of the ceremony we all joined the rest of the wedding guests for a barbeque at the John Muir House. The lodge-chef had prepared some pretty awesome food options, and had previously told Michelle that he believes if you serve amazing food at your facility that guests will remember that and come back again. That night there were drinks to be had, smores to be made, and plenty of stories shared around the campfire after “the adults” had all gone back to their cabins, hahaha! The wedding day started slowly as many guests tried to figure out where they would go hiking that morning. As usual, I tagged along with Michelle and chatted with her and her family members getting to know everyone a bit better throughout the early afternoon. As the ceremony time approached, I headed over to meet up with the guys and get a few shots of them as well. As I arrived at the Muir House where everyone was staying, I found most of them scrambling a bit to finish getting ready. It seemed as though they misjudged just how long the hiking would take! Uh-oh! But the ceremony started without issue, went beautifully, and the reception was a blast. I’ll save most of what I have to say for the captions on the images below. I had a great time though, and was thrilled to be part of the Boyko wedding so unexpectedly.